You can never have too much Lovecraft. Well, unless you’re a total scaredy cat. 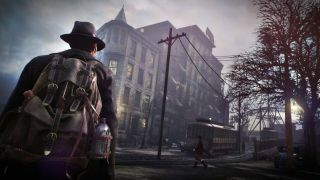 Otherwise, The Sinking City, Frogwares’ upcoming open world adventure set in the dystopian metropolis of the title, looks like a game worthy of the great cthulhu itself. An extended, cinematic trailer for The Sinking City has made a surprise appearance at The Golden Joystick Awards this evening, and it gives you a better look at the world, story, and tone of the game before its impending release next year. You can watch the whole thing in its entirety right here. Yeesh. There is a lot going on in The Sinking City, that’s for sure. I don’t envy the plight of protagonist Charles Reed right now, the private investigator sent to the damp, distorted streets of Oakmond - the fictional 1920’s half-submerged city on America’s eastern coast - to uncover the dark truth hiding beneath its cobbled streets. You can expect plenty of frights and twists in the full game, too, where you’ll be free to explore Oakland with an arsenal of era appropriate weaponry, conducting investigations using Reed’s deductive powers and coming to blows with all kinds of lovecraftian horrors. The Sinking City will launch for PC, PS4, and Xbox One on March 21, 2019, so you have a little while to prepare yourself until then. In the meantime, it’s still all kicking off at the Golden Joystick Awards 2018, with more announcements in store as the celebrations continue at the Bloomsbury Big Top in London. You can watch the entire show on Twitch right now, or keep checking back in with GamesRadar for coverage of the biggest news from the show.